Six rare to find chromolithographic French trade cards, with the best graphics! Date to 1880's to 1900's, it's wonderful to find a complete set of six. 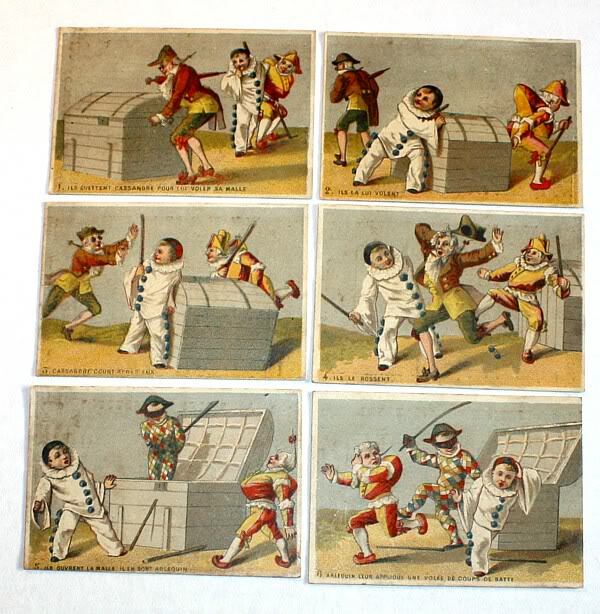 Lovely bright colors, these French trade cards are a desirable Victorian ~ French collectible. Perfect to frame together. On the back, the advertisement for J. Combe, Epicerie Fine & Comestibles, Vins Fins et Liqueurs, Conserves, Huile D'Olive Vierge and Speicalite de Cafes et de Chocolats is printed in black lettering. Each measures 3~5/8" x 2~1/2".